The English Football League and Quest are at the start of a beautiful friendship! From August 2018, we will be the new home of the EFL highlights featuring the Sky Bet Championship, Sky Bet League One, Sky Bet League Two, Carabao Cup and Checkatrade Trophy. 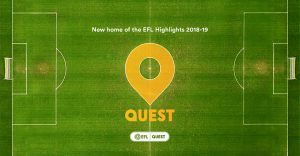 The partnership between the EFL and Quest will guarantee FREE high quality, matches for football fans across the country. Kicking-off in August, we will be airing 90 minutes of extensive match highlights, hosted by Colin Murray at 9pm every Saturday night with expert pundits (yet to be named) on the couch. We will also broadcast 10, hour-long highlights shows capturing all the action from every round of mid-week fixtures. In addition, we will also be presenting eight, hour-long highlights shows from the Carabao Cup and Checkatrade Trophy. The EFL highlights will headline our line-up of sports events throughout the year which are delivered by using Eurosport’s sport production expertise. This already includes snooker’s Home Nations series, cycling’s Giro d’Italia, British and World Superbike Championship. Each show will feature every goal from every EFL fixture plus in-depth analysis from the presenting team. In a first for the EFL, we will produce “The Reaction” a new weekly interactive Facebook series also presented by Colin. With a strong focus on engaging with fans from clubs across the league, the series will offer the chance for supporters to voice their views on the day’s matches.